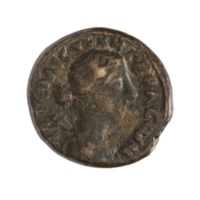 Civic bronze coin from Gerasa (180-182 CE?) 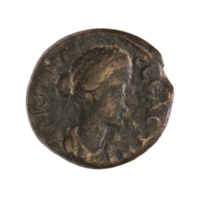 depicting Crispina (empress, wife of Commodus). The design of the Crispina type is very similar to depictions of the earlier empress Lucilla (GER0117), wife of Lucius Verus. Meshorer, Y., G. Bijovsky, and W. Fischer-Bossert. 2013. Coins of the Holy Land: the Abraham and Marian Sofaer Collection of the American Numismatic Society and the Israel Museum. New York; The American Numismatic Society. SNGANS 6. Sylloge Nummorum Graecorum, USA, the College of the American Numismatic Society, Part 6: Palestine-South Arabia. New York: American Numismatic Society. 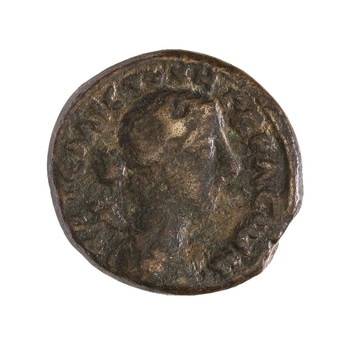 “Bronze coin of Crispina (GER0101),” WIRE: Women in the Roman East Project, accessed April 24, 2019, http://www.wireproject.org/items/show/5.